Are Credit Unions As Good As Banks? How Do They Compare? Home » Are Credit Unions As Good As Banks? How Do They Compare? When it comes to where you put your money, it can be hard to pick between a credit union and a bank. They look the same on the outside, but are they really the same type of financial institution? Which one is better for your savings and checking accounts? Here is the low down on what a credit union is and whether or not it is right for your finances. Credit union members, like bank customers, have access to checking and savings accounts, CDs, loan products, and credit cards. What makes a credit union different from any bank is that it is actually a cooperative financial institution that is owned and controlled by its members. Its members are those who use the institution, such as people who have a checking account, savings account, or loan. The purpose of the credit union is to promote savings and provide credit to its members. One huge difference is that credit unions are non-profit companies, where as banks are focused on profit. This means that credit unions tend to have their members best interests in mind. This is also why you will not see as many promotional deals or advertisements from credit unions. While a credit union doesn’t seek financial gain from their customers, they still charge late fees and APR for loans. Since banks are for profit, they are also more likely to take bigger risks and charge their customers with higher fees and lower savings rates in tight times. Since a credit union is made up of members, all of the members need to be related in some way. For example, a teacher’s credit union will just be for those who are teachers. A standard credit union may require you to be related to or know another credit union member or live in a certain area (there are a lot of county-focused credit unions). While this may seem daunting, most people will be able to secure access to a credit union account. You don’t have to worry about putting your money in a credit union either. Many individuals think that since credit unions are different than banks that they offer little in means of financial security. This is simply not true. Just like the FDIC (Federal Deposit Insurance Corporation) insures regular bank deposits, deposits at a credit union are insured up to $250,000 by the FCUA (Federal Credit Union Association). Also, when you look at the last financial crisis, more banks went out of business compared to the number of credit unions that went under. Lower Fees: Even though credit unions still charge fees, they may charge a lesser amount. For example, traditional banks charge a $35 overdraft fee, where as some local credit unions might only charge $25. Credit unions are more likely to have low to no minimum account balances, which means you will not have to pay a monthly fee to hold a savings or checking account. Better Service: Since credit unions are member-focused, you can expect better service. It is nice to go into a small branch and be greeted by a banker who knows you. More Flexibility: Larger banks do not usually have the time or resources to check over loan and mortgage applications. Because of this, they will automatically decline a loan based off of numbers. Credit unions, on the other hand, look at loan applications based on the whole picture. They look deeper than just your credit score and can extend loans based off of merit. They are also more willing to make exceptions for unique circumstances, such as being self-employed or having a bankruptcy on your record. They Are Part of the Community: Credit unions are more likely to be involved in community events and charities. Accessibility: If you bank with one of the big names, like Chase, chances are you will easily find an ATM or bank location in just about any city. Chase banks and ATMs are everywhere it seems, even in popular grocery store chains and CVS stores. Credit unions on the other hand are meant to serve a community, so usually there is only one or two locations in an area. Having a checking account with a credit union could make traveling harder, since you will have to rely on other ATMs for cash, which can cost $3-5 per transaction. Check with your local credit union to see if they offer ATM fee reimbursements. Not as Many Bells and Whistles: Since big banks have a lot of money at their disposal, you can bet that they will have cutting edge technology. A local credit union may not have the banking technology that you crave, such as an app, check cashing through your smartphone, online bill pay, or EMV cards. However, many credit unions are trying to stay on top of what is current, so you might be pleasantly surprised by how up to date your local location is. Low Rewards: When it comes to cashback rewards through credit card spending, very few credit unions have it. In fact, according to bankrate.com, “Some cards issued by banks offered up to 6 percent cash back in certain spending categories, credit-union-issued credit cards topped out at 1.5 percent.” If you are going to get a credit card, you might as well utilize it to your advantage by getting as much of a reward for spending as possible. Can Credit Unions Compete with Banks? So, given that credit unions are there to serve their members, can they compete with savings rates and loan rates compared to banks? Some credit unions offer the same savings rate and loan rates that traditional banks offer. What you usually will not find, though, are promotional offers for signing up for an account. Since the larger banks are all about the profits, they have more money dedicated to advertising and promotions. For example, Discover Bank typically offers one of the best yields on their high yield savings account if you deposit $500 or more. When you research the lowest banking rates or best loan rates, you might notice something. There are not a lot of credit unions listed on the popular financial sites. This is not because your local credit union doesn’t offer good rates. Instead, big banks are more likely to offer a kickback to websites that promote their products, which makes the site more likely to push a particular bank or write praise about it. Since credit unions are local, there is a good chance that one of your friends or family members has an account with a local credit union. Ask them about it and see if they like it. Also, you can visit MyCreditUnion.gov or NCUA. If there are several credit unions around you that are eligible for you to join, take some time to compare their rates and offerings. Not sure if you qualify to be a member? The easiest thing to do is just to ask. Many credit unions have easy guidelines to join. 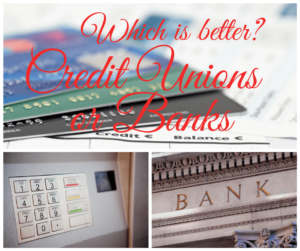 The Bottom Line: Which Is Better, A Credit Union or Bank? Is a credit union the best choice for you? The answer really depends on what you want in a financial institution. If you want accessibility and the ability to cash in on great promotions and rewards, then a big bank may be your thing. However, if you desire to have a financial institution that cares for you and your finances, then a credit union wins hands down. Just ask individuals that have banked with both a bank and credit union, and majority of the time, they will say they prefer the credit union. When it comes to rates, the top competitive banks and credit unions will have very similar rates on financial products. Since most rates are competitive, you can then focus on other features that matter to you. For me, my bank of choice is USAA. You can see in my free tools section the other financial tools I use, and they are mostly large banks. In my experience, I’ve found higher interest on my savings, and lower loan rates by finding online major banks. Every time I’ve shopped by local credit unions for car and home loans, they’ve always been about 0.50% higher than the best rates online offered by major banks. That is a big difference on a home loan. Readers, now is your chance to weigh in. Have you ever had experience with a credit union? Do you like them more than traditional banks? Why or why not? I literally just signed up with PenFed credit union today to get a 5% cash back card for gas. Show me another company that offers the same rewards? The only one I know of is my Amex Blue, but that’s only after I’ve spend $6,500 on the card in a year. I completely agree that credit unions can’t compete with larger banks. I personally have accounts with major banks but I do most of my banking through a credit union. For example I have them for my checking account where I recieve my paycheck and where money flows from to pay credit card bills. I enjoy going to them with checks and such because they are always kind and willing to help. I’m not sure if you took this into consideration but some of them offer dividents as well which I too recieve. I believe that this changes the interest that they pay out. Why do you think bankrate.com or other comparison sites would list credit unions? They don’t pay referrals! Here’s a simple example. I use the above site to find the best paying checking account and I get flagstar direct bank with an APY of 0.90. I’ll compare it with my credit union Alliant which won’t turn up on any comparison site (it’s a credit union!) and that offers me 1.10 APY! The same goes for mortgage comparisons. A credit union beats banks any day. I bank with credit unions and have my mortgate with CUs and none of the comparison site banks can beat the rates. I have been a member of a credit Union (Xerox) for nearly 40 years! I use my credit union for car loans, although I have not had a car loan in 11 years. It is another resource to compare when you are making your financial decisions. It must be a pretty good credit union, because all of my local ones are really not that great. I think you have to put in a little more shoe leather to find a good credit union as they don’t have a marketing budget like the online banks. But they have a lot of advantages if you find the right one. Good points in your article. @Justin – I have one card through a bank that is prime +0.5%. That currently has only a 3.75% interest rate. I never use that card though, as I don’t carry a balance. I look at cards with the highest rewards possible to reap the benefits. Also, there are a ton of banks that offer free ATMs and coin counting. @Evan – Maybe we should make a site like Bankrate for credit unions? I have been banking with Navy Federal Credit Union for over 25 years. Every time I need a loan, I do my shopping, and always have to go with my credit union due to lower rates. I am currently refinancing under HARP and there is no comparison with commercial banks. I am sorry, the internet is dominated by interest groups with big marketing budgets, which is why there is not that much advertising from non for profit credit unions. Glad to hear your perspective. Navy Federal has been awful for me when I’ve tried to get a loan. Their rates were about 1% higher than what I was able to get from a bank (Wells Fargo), and their customer service has always been miserable. I try to avoid them whenever possible. I think having a well-balanced split between credit union banking and for-profit banking is key. I utilize my local credit union for major banking; i.e. paycheck deposits, bill pay, personal loan, and paycheck advance. Whereas I utilize a for-profit bank for my rewards credit card and the internet bank, Ally, for my savings/emergency funds account. This mix gives me the best of all worlds.